The life expectancy increase of baby boomers, a shrinking work force, inadequate funding of healthcare, a shortage of family doctors, plus high insurance premiums are all contributing factors leading to a primary healthcare system in the United Sates thats under extreme stress. Many of us have a healthy aversion to doctors and hospitals. That said, were grateful they exist when we need themespecially those of us who live in urban areas with some of the most cutting-edge health care facilities and services available nearby. Producers must start preparing... This years recent MIPtv 50th Anniversary (Cannes, France, April 6-11) is, in part, a celebration of past achievements. However, MIPtv is also looking forward to broadcastings next major move. Anik G1 provides expansion capacity for DTH services over Canada, a new X-band payload for government services, and additional C-band and Ku-band capacity for South America. as well as the business plan. WORK Microwave is a very engineering-driven company with an excellent reputation in the industry and a flat hierarchy that encourages experts to work with enthusiasm. I liked the idea of working for a company that values working quickly, pragmatically, and on a personal level. New technologies, industry players, and economic pressures are driving innovation and new business models in the space business. How your organization positions itself in the dawn of this new age is vital to how successfully you capitalize on these new challenges and opportunities. A Case In Point  The Afghan Connection , A Globecomm conversation with Amirzai Sangin, Minister, Ministry of Communication and Information Technologies, the Islamic Republic of Afghanistan. In this interview conducted by Globecomm, Minister Sangin discussed the unexpected path that led from these government communications projects to a true telecommunications revolution at the local level. Not All Ka-Band Satellites AreThe Same, As spectrum at Ka-band is readily available, all can expect to see quite a few upcoming Ka-band satellites. 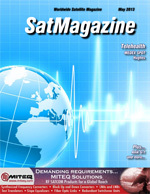 The congestion at C-band and the high levels of utilization of existing Ku-band capacity has resulted in the satellite industry expanding into the next frequency band available for satellite services, Ka-band. Why is the employment scene like a zoo? How does Darwin play into this equation? What makes this a great time for employers to make exponential gains? With the first quarter of 2013 in the history books, three employment-related trends are worthy of mention. Our information comes from industry conversations in multiple settings including the recent March SATELLITE 2013 Show in Washington DC. A discussion with Mr. Zarkesh regarding the rebranding of satellite connectivity for Latin America (LATAM). Each of the wireless and satellite carriers now has substantial human and financial resources devoted specifically to M2M. Each has retooled their data offerings to be more attractive to M2M users directly, rather than focusing on a reseller strategy. And, most tellingly, there have been some impressive investments made to acquire capability in the M2M sector through inorganic growth, reflecting both time pressures as well a shortage of expertise as M2M has grown overall.